Cite page (MLA): Ward, Megan, and Adrian S. Wisnicki. "Field Diary II: An Overview." In Livingstone's Final Manuscripts (1865-1873). Megan Ward and Adrian S. Wisnicki, dirs. Livingstone Online. Adrian S. Wisnicki and Megan Ward, dirs. University of Maryland Libraries, 2018. Web. http://livingstoneonline.org/uuid/node/1d5af01e-faa6-4ef8-9176-fc6458fb77f. This page introduces Field Diary II, which is part of our critical edition of Livingstone's final manuscripts (1865-73). The essay notes key events in the first two months of Livingstone's journey inland from the eastern coast of Africa and summarizes Livingstone's observations on local climate, topography, and culture. The essay also describes the form of the diary and its key features. Field Diary II picks up where the previous diary left off, as Livingstone and his men leave the eastern coast of Africa and begin their trek inland. As in the previous diary, an opening note (c. late 1940s-early 1950s) from Rev. James McNair indicates that he has assessed the similarity between this account and the one published in Horace Waller's edited Last Journals (1874). This diary is "the basis for the entries in the 'Last Journal,'" writes McNair; divergences "have been penciled where noticed" (Livingstone 1866a:). The note suggests that even from this early date Livingstone scholars and enthusiasts were interested in how his account has been shaped by the publication process. 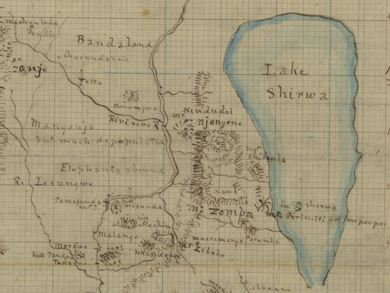 Map of Rovuma River and Lake Nyasa (Livingstone 1866-1867:). Copyright National Library of Scotland. Creative Commons Share-alike 2.5 UK: Scotland. The area covered by this map roughly corresponds to the area through which Livingstone passed while writing Field Diary II. The map traces the expedition's route from the East African coast into the interior. Field Diary II describes Livingstone's travels with a group of men that includes Sepoys, "Johanna men" (a group hired at Johanna [Anjouan] Island to accompany Livingstone), and "Nassickers" (men from his previous trip who were educated at the Nassick school for freed slaves in Nashik, India while Livingstone was in England between journeys). In addition, Livingstone hires an Arab guide, Ali, for this portion of the trip, and also day laborers from the Makonde, an African ethnic group, to clear the path and carry things (Livingstone 1866a:). Livingstone's tone at starting out is positive; though the path is often overgrown, they make steady progress. His interactions with local headmen appear uncomplicated; for instance, he notes simply "The old man Monyink? presented a goat and I gave him 2 fathoms of calico" (Livingstone 1866a:). By 10 April 1866, his men become afflicted by malaria (or, as Livingstone simply calls it, fever), though they respond quickly to treatment. From this point forward, the diary periodically logs the illnesses and treatments of men and animals (donkeys, camels, cows, and dogs). Images of two pages of Field Diary II (Livingstone 1866a:, ). Copyright David Livingstone Centre. Creative Commons Attribution-NonCommercial 3.0 Unported. The page at left (top in mobile) represents a typical page of Field Diary II. The page at right (bottom) contains a list of Livingstone's carriers and the item each carried (in gray pencil) plus a vertically-oriented annotation of the list and a diary entry (both in blue pencil). As these illnesses take their toll and the route becomes more difficult, the tone of the diary changes from hopeful to worried. Conflicts also emerge among Livingstone's men. Livingstone documents his struggles to mediate among the men and also to maintain his authority as incidents of theft, fighting, and punishment arise. This is difficult not only within the group, but also because Livingstone worries that whatever punishment he delivers "would be commented on by the Makonde" (Livingstone 1866a:). Throughout the diary, Livingstone interweaves his own memories of conflicts with the Makonde from his previous journey as well as accounts from Ali, using these accounts to explain the "awe" or even "fear" with which the Makonde treat the English (Livingstone 1866a:). While traveling, Livingstone records details of the local climate and topography as well as observations about Makonde language, culture, and appearance. Some of this is first-hand observation, as when he writes, "many of the men profusely tattooed - teeth sharpened to points they say for beauty" (Livingstone 1866a:). Other times, it is hearsay, as when he notes, "they are said to fear the English - They sell each other to the Arabs" (Livingstone 1866a:). He concludes the diary with a long entry on his wish that he could act as a missionary on this journey (though he does not) and meditates on the Biblical doctrine of individual "inborn sin" as compared to the "natural sense of justice" he has observed of the Makonde as a whole (Livingstone 1866a:, ). An image of two pages of Field Diary II (Livingstone 1866a:-). Copyright David Livingstone Centre. Creative Commons Attribution-NonCommercial 3.0 Unported. This field diary map corresponds to the middle segments of the more polished map shown above. Together the maps offer an excellent example of the manner in which Livingstone revised and integrated his cartograhic observations. This diary takes the same material form as Field Diary I, a hardback book with a green silk cover that has become ragged with time, measuring 152mm high by 95mm wide and 9mm thick. The writing flips upside down on p. 101, suggesting that, as in the first field diary, Livingstone writes from the front and back simultaneously. Seven sketches are mixed with Livingstone's writing, and the final two pages comprise a large map with the spine oriented horizontally through the middle. This map is dated 2 May 1866 and documents rock formations, the lands of different ethnic groups, and a route that marks "brackish water" through the Metambwe valley, Nangadi lakelet, and Urongwe lakelet (Livingstone 1866a:).